Through the work we have done in Detroit—and by witnessing firsthand the various approaches, partnerships and tactics that have emerged on the ground—The Kresge Foundation decided to start a conversation: both an exploration of the practice and policy that surrounds the Detroit experience and an exploration of what aspects of the city’s recovery have resonance in other communities. If revitalization, recalibration and re-ignition can occur in Detroit, what lessons might the Detroit experience carry for other cities? And, might some components of this kind of recovery be useful in other places across America? To answer these important questions, Kresge’s Drawing on Detroit Initiative supports convenings, thought capital and academic research to uncover important lessons the city of Detroit can lend to other cities facing difficult municipal challenges. Kresge’s Detroit Reinvestment Index measures what local residents, local entrepreneurs and national business leaders think about Detroit. Kresge Foundation President and CEO Rip Rapson discusses lessons that other American cities might draw from Detroit, in an address to civic and philanthropic leaders in Memphis, Tenn., in August 2016. Detroit’s emergence from bankruptcy and its economic revival are the focus of a special supplemental issue of SSIR which was produced in collaboration with The USC Center on Philanthropy and Public Policy and supported by The Kresge Foundation. Watch highlights and panel discussions from a national forum on revitalizating of American cities, on topics ranging from philanthropy's catalytic role to building economic flywheels and developing bold urban leadership. The Kresge Foundation and The Center on Philanthropy and Public Policy at the University of Southern California held a national forum in Los Angeles in May 2016 to discuss revitalization of American cities. Drawing explicitly on the experiences of Detroit and philanthropy’s catalytic role, 170 policy makers, urban thought leaders and practitioners from more than 15 cities explored how lessons learned in Detroit might benefit other cities facing similar challenges. 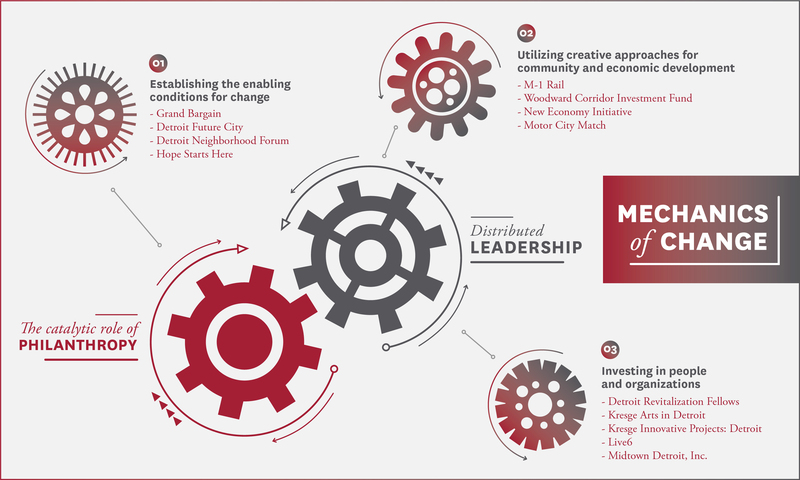 The conference featured six plenary sessions on philanthropy's role in cities, lessons learned from Kresge's work in Detroit, creating conditions and plans for change, fostering economic development and the need for bold leadership.